Hello! 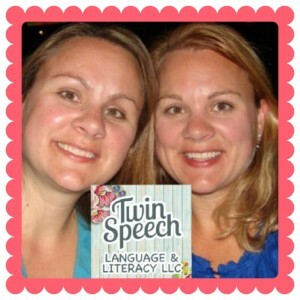 This is Manda & Shanda from Twin, Speech, Language & Literacy LLC. 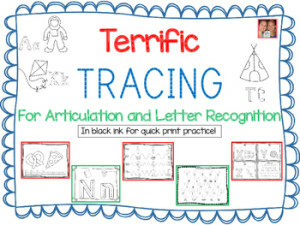 Today we're writing about some of the fun ways that we have been teaching letters to our students whom prefer to learn in a more tactile and kinesthetic way. Do you know a student who exhibits a more "on-the-go" nature and enjoys to learn new things while completing an activity? We have several students coming in for speech therapy at our outpatient clinic right now that seem to learn the best this way! They do not prefer to sit down at a table in the more traditional pen and paper style, but otherwise will stay engaged, focused and happy the whole session through if we give them the opportunity to move and touch in the therapy room while they learn. As speech-language pathologists, Shanda and I both feel that it is important for us to support the development of literacy skills while targeting speech and language skill treatment goals with our students. We know that if we help them to recognize and write their letters, increase their phonemic awareness (the knowledge that spoken words can be broken apart into smaller segments of sound known as phonemes), and their phonics skills (the knowledge that letters of the alphabet represent phonemes, and that these sounds are blended to form written words), that they will have a stronger foundation for later reading and writing skills. Speech therapists across the world are helping children to build their literacy skills every day. And our role in this area has been defined by the American Speech-Language-Hearing Association (ASHA). ASHA's position statement regarding literacy was written in 2001 and it explained that SLPs should help with a students literacy skill development in many ways. For instance, we should help with prevention (by fostering language acquisition and emergent literacy), we should help with the identification of children who are at risk for literacy delays, with assessment (in the areas of reading and writing abilities and how they relate to spoken communication), with intervention in reading and writing, and with helping other professionals know about the close relationship between language and literacy. SLP's can truly help children become more successful in school and in life. A person who advanced in their speech skills, will also have advanced in their writing and reading skills. 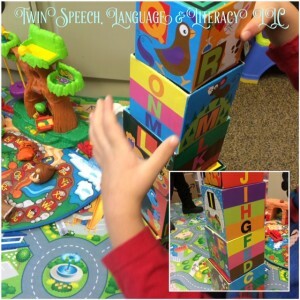 Here are some ways we are teaching literacy skills while targeting speech and language skills. 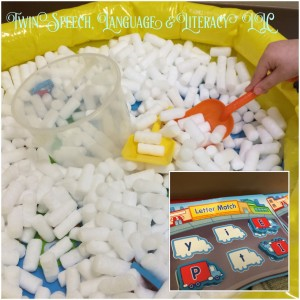 Seek-n-find letter games can be done in a variety of ways e.g., with scavenger hunts around the room or by hiding them inside a sensory bin of some type. Here is a picture of when we hid letters inside of "snow". 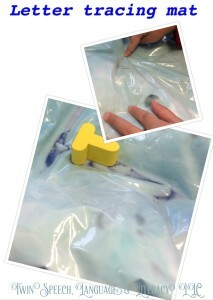 With this activity, the students used shovels to dig around a small pool full of packing peanuts. They liked shoveling through the packing peanuts to find the letters hidden within. After they shoveled up the letter, they were asked to see if they could match the uppercase letter to its corresponding lowercase letter on a mat. 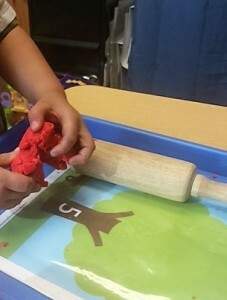 We often have our students form letters using play dough or clay. 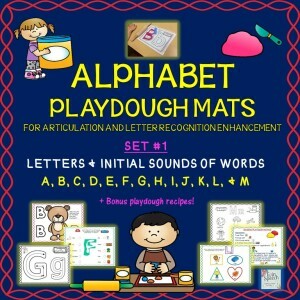 Students of all ages like the tactile experience of play dough and given a little encouragement and a letter-themed play dough mat, they can form letters with it. We have a lot of play dough mats that we use that help us to practice articulation and letter recognition with our students! 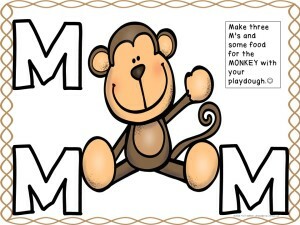 This is an example of one of our Alphabet play dough mat products and a monkey-themed page targeting the "M" sound that is found within it. 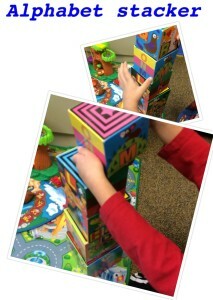 We love doing puzzles in speech therapy because they help increase problem solving skills and keep little hands moving! 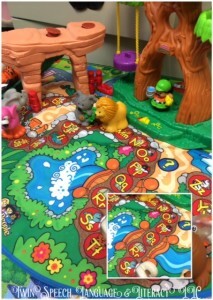 What makes puzzles more fun though, is putting the pieces into a sensory bin of some sort. We have all kinds of sensory bins at our clinic. Some of the bins are filled with beans, some have rice, some have beads, this one is filled with blue little beads. 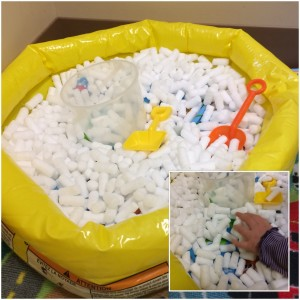 Most children love the sensory input to their hands when using these buckets. They will often say that it, "feels nice" or that they "feel relaxed." The students were asked to name the letter before they placed it into the puzzle and once finished with the puzzle, we went through the alphabet once more before placing them back for the next student to try. Most students love to build! We use block towers with letters on them and before they get to knock the tower over, they are encouraged to read the letters on them. 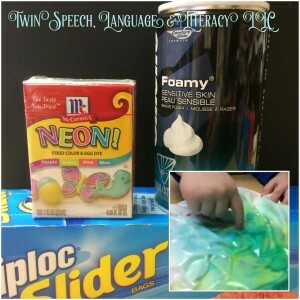 We make these writing pads with our students because they enjoy the feel of bringing their hands through the shaving cream and they like seeing how the colors mix up. They are easy to make and the students love to take part in the making of them! Just put in about a half a cup of shaving cream in a plastic bag that seals, put in about five drops of three different food coloring colors, close the bag, staple and put some tape on the top to make sure it is extra sealed and you are done! 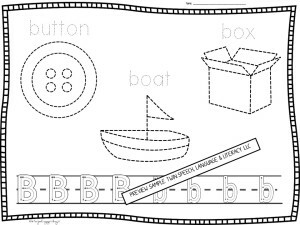 We write letters on the bag in permanent ink and ask them to copy the letters onto their mats for writing practice. 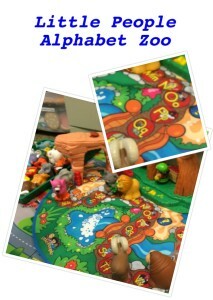 We have a lot of games that help to increase letter recognition, but this Fisher- Price Little People A to Z Learning Zoo Playset has got to be one of our most favorite! The kids match letters to animals that start with the letter and they also get to hear the name of the animal and what it sounds like. This is a great interactive activity for teaching letter to word match and for increasing animal vocabulary. 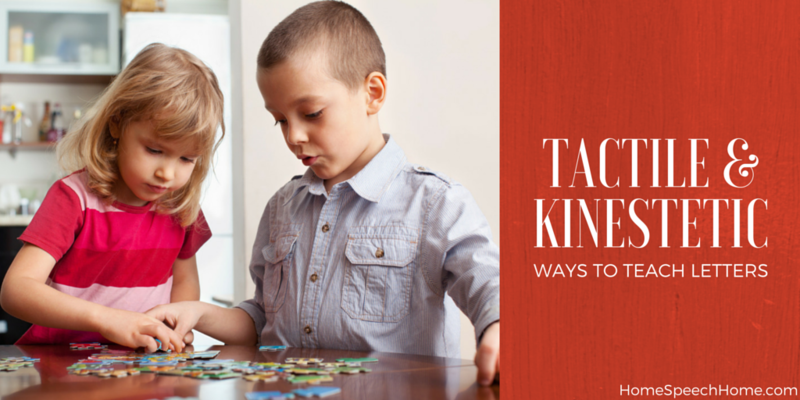 This game is just perfect for every active learner. Just throw and name the letters! The Velcro sticks to the mitts. 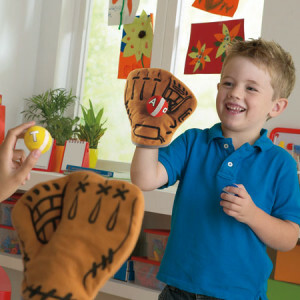 You can have the child name the letter before and after the throw, give the sound the letter makes, or even come up with a word that begins with the letter on the Velcro ball. This interactive ball throwing game has been used a lot at our clinic with some of most active learners. They love the challenge of catching and throwing the balls and hardly seem to mind the letter work that is being targeted during the game play. 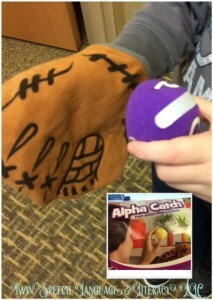 Alpha Catch can be bought at Educational Insights. 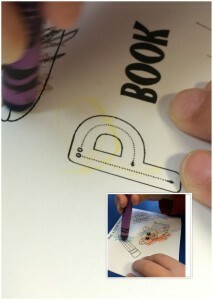 Kids that like to move a lot still seem to not mind doing a "mini" book activity. 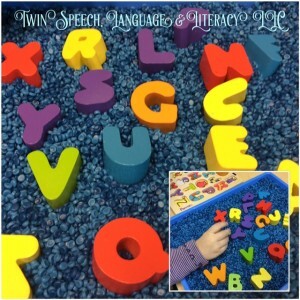 We have these quick and easy letter trace and coloring books in our Twin Speech TpT Store that we use for working on articulation and identification of sounds. 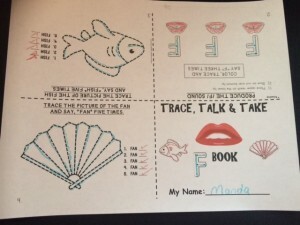 How about offering just one or two quick trace worksheets? If the student that you are working with prefers, just let them stand while they do their trace work. 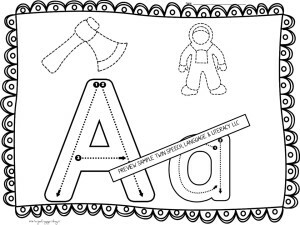 Pick up a whole alphabet full of quick trace and name upper and lowercase letter worksheets! Shanda Gaunt and Manda Riebel are both M.S. CCC-SLP's. We both have over 18+ years of therapy experience each and have worked in a variety of therapy settings such as: hospitals, schools, rehab centers, and outpatient therapy clinics. Our combined clinical expertise includes: speech, language, voice, fluency, swallowing, articulation and cognitive rehabilitation for both children and adults. We like to keep our holiday and seasonally themed therapy sessions original, fun, interactive and productive for each person. Our teaching style is supportive and goal centered for each individual person that we see. We believe in making each session one that each child or adult will look forward to and that is themed based.